There is, perhaps nothing that personifies the spirit of America more than a state or county summer fair. The California Mid State Fair, in rural Paso Robles may be the best example of this classic American experience in the golden state. The small agricultural community of Paso Robles sits in a fertile valley surrounded by majestic mountain ridges, farther from any major metropolitan area than most any other community in Central California. Consequently, the area has become a coveted tourist destination, especially in the summer during the ten days of the fair. The event is a classic fair complete with competitions for all manner of farm animals, an old fashioned carnival with rides and games and copious amounts of comfort food and beverages. The fair was well under way on Monday July 25th when the Hollywood Vampires came to play the final show of their summer tour. The band arrived early to linger backstage and do a prolonged meet and greet with contest winners and special pass holders. Meanwhile, most music fans were lingering in the main fair grounds. There was a whole host of activities to choose from. Young children were showcasing their farm animals, striving for the coveted blue ribbon awards. Huge milk cows were being paraded in front of one arena, while others were vacuuming their prize sheep and goats in another, for their competition. With temperatures nearing the 100 degree mark most fan patrons found indoor bars and exhibits to find respite from the blazing sun. One exhibit featured local school art and photography contest winning ensembles, mixed with an array of exotic animals. A hairless cat, long armed monkey and a South American armadillo created a big stir. Live music was also plentiful in the main fair area. Brandi Clark attracted a large crowd for a late afternoon performance. The country rocker was nominated for a best new artist Grammy last year, but it is her songwriting skills that have put her on the map. Her songs have been recorded by Sheryl Crow, Miranda Lambert, The Band Perry, Reba McEntire, LeAnn Rimes, Billy Currington, Darius Rucker, and Kacey Musgraves. She played a crowd pleasing set backed by a strong country rock band, while the scent of barbecue wafted through the air. The Chumash grandstand arena opened shortly before the 7:30 main event. The arena which holds over 14,000 people featured a near two week line up of top pop music talent. The Monday show by the Vampires brought in over 8,000 people filling the arena to just over half its capacity. The Vampires came on stage at 8.30 ready to rock. There was some concern whether Aerosmith guitarist Joe Perry would be up to the task, after his mysterious July 11th collapse during a concert and subsequent hospitalization. But there was no sign of weariness in the master guitarist Monday night, who performed brilliantly throughout the set. Whether it was the fact that this was the bands final night of their summer tour or that they were happy to have Perry back, the band seemed to be truly living in the moment, frequently prancing about the stage, chatting each other up and laughing gleefully throughout the set. The Hollywood Vampires began as a tribute to the many fallen rock stars that used to frequent the infamous Rainbow bar on Sunset strip in Hollywood. 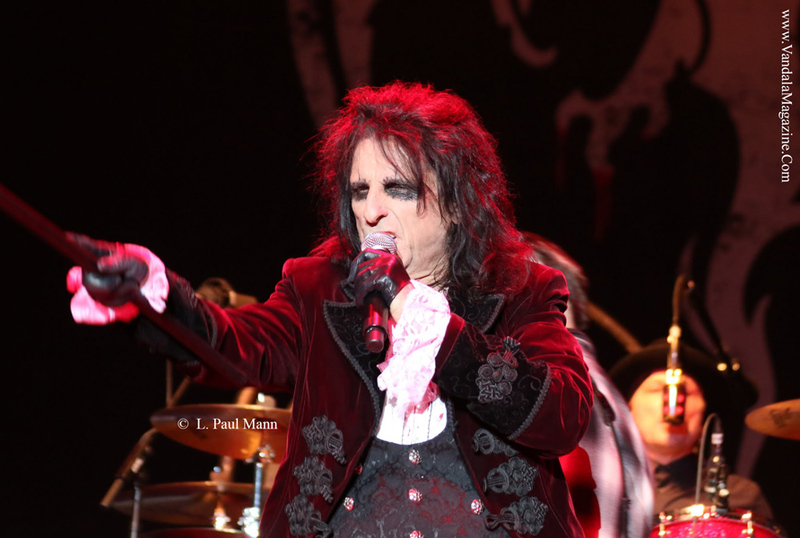 The brainchild of Alice Cooper and Johnny Depp, the idea actually morphed from a tribute set that Cooper was already performing over the last several years, during shows with his Alice Cooper band. The tribute would feature a mini set of cover songs, featuring dead rock stars, including Jimi Hendrix, The Who and The Doors. He expanded the idea into a tribute band and recording honoring his crazy rockstar friends and their infamous adventures on Sunset Strip. He enlisted the help of Johnny Depp. FYI, sorry to the haters, but yes Depp can really play guitar. During his performance Monday night he frequently played lead rhythm guitar with his own unique style and finesse. Depp brought along Bruce Witkin, his former band mate from the rock group the Kydz, which Depp joined in 1980. Witkin is sort of a rock everyman, playing bass drums, keyboards, guitar and is also a singer songwriter. The band also features Perry on a searing lead guitar and Cooper protégé, Tommy Henriksen from the Alice Cooper band on guitar and vocals. The band is completed with a rhythm section featuring go to rock drummer Matt Sorum, from Guns N Roses and Velvet Revolver fame and veteran bassist Robert DeLeo, from Stone Temple Pilots. Sometimes Duff Mckagan takes over the bass duties. The band played the same 21 song set list that they have been touring with during their summer tour. The set featured covers of songs from the bandmates respective bands, and a few originals, as well as the extended list of their dead rocker tribute. The band played full throttle during the entire set bouncing off one another like pinballs in a pinball machine. Cooper would frequently address the crowd and introduce each song. During the introduction of “As Bad As I Am”, an original song from the band, Cooper explained that Depp had written the song about his step father, before introducing Depp, who launched into a piercing rock rhythm. The group not only played the part of rebel rockers but dressed the part as well. Cooper wore his classic horror garb, and had vampire marks painted on his throat. The rest of the band were also dressed like pirates. Depp even sported the same pirate teeth from his infamous Jack Sparrow character. The band seemed to play with ferocious intent but an uncanny ability to morph into a cohesive unit making each cover sound like their own original music. Sometimes the group would rework the covers into their own unique and interesting arrangements. For instance, on the classic cover of Whole Lotta Love by Led Zeppelin, the lead vocals switched from Cooper to Witkin on the critical high pitched wails. While Witkin hit the high notes, Cooper switched to a blazing harmonica jam. Any classic rock fan would have to love this set of some of the best rock songs ever made. The band even reached back into the past, with hits like Bang a Gong (Get it On) by T Rex. The band returned triumphantly with a multi song encore joined by Def Leppard guitarist Phil Collen. Whether he was there as back up for Perry in case he could not continue, or was just there as a friend for the bands final performance on the tour, it was great to hear him join the searing cacophony of guitars on the classic rock song Train Kept A-Rollin by Tiny Bradshaw. The band ended with a classic from the Alice Cooper show, which features a morph of School’s Out into Pink Floyds Another Brick In The Wall. There has been some unofficial talk of a benefit show by the band coming up in Los Angeles later in the summer, but nothing has been confirmed.